Hi, I'm a European-American. If you want to be specific, I'm a Hungarian-Slovenian-American, but I've never donned any of those monikers. Both of my parents were born in this country. Out of the thousands of black people I've met in my life, I've probably met a handful that were actually born in Africa. Yet, we use African-American all the time. I think it's time to retire the label "African-American". I don't know where or exactly why that term emerged in our lexicon. Was it guilt? Was it a people who had their past stolen from them by greedy people - both black and white - who ripped them from their homeland and brought them here. However, the term African-American came about, I don't see any reason why it exists today. 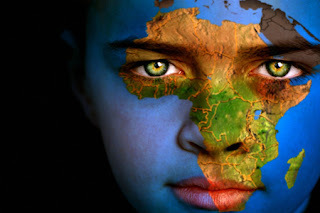 Most of the kids I know, black, white, Latino, don't know that Africa is not a country. And there isn't one single black person I ever met that wants to go to Africa - not even to visit. They be fine right on the south side of Chicago. The truth is, with the exception of a minute amount of immigrants that actually came here from Africa over the last 50 to 100 years, it's been centuries since any of the black people in this country had a relative that was from Africa. Generation after generation has passed and the distance between here and Africa is relative to the distance between us and the moon. Who knows, maybe I'm a Lunar-American and I don't even realize it. I know other groups hold on to their hyphenated heritage: Italian-Americans, Irish-Americans, Jewish-Americans. But many of them have had family move here from the motherland within the last century. As in Mexican-Americans, 100 years ago they all lived in Mexico. Two hundred years ago, they all lived in Texas and California. Strange how that all worked out. In America, Hispanic or Latino-Americans will be most justified in having the hyphen. They have come here and established communities where they didn't have to learn to speak English. After years of these small pockets growing, we wound up with bilingual everything. I'm inadvertently learning Spanish, just so I can find the English directions on the stupid Ikea desk I bought. On the other hand, I don't know any black people that speak Swahili or any of the other languages of Africa. Directions from Wal-Mart come in English, Spanish, French and Japanese - no Swahili. In the days of Martin Luther King, he dreamed of an AMERICA... somehow that got lost. And as long as we hyphenate ourselves from our reality, we will always be separated from the whole. It's time to retire the label African-American. We're all Americans, no matter what color we are or where our great-great-great-great-great grandparents came from. I've been saying this for some time, Roger. It's amazing that we're the only country that feels the need to categorize one another by the color of our skin. It makes little to no sense whatsoever! Yet, we continue to practice it every single day. There are so many things people find fault with in this country, but no one seems to find fault in the things we should be finding fault in. This is a great example, as well as how this country takes away certain right for citizens that are different, practice lifestyles that are others disagree with, so on and so forth. I wonder will we ever get these issues right... I mean really! I heard a black comedian say not to long ago, "I have no intentions on going back to Africa. America is my home. And here's a News Flash, most Africans don't even like American black people." That in itself is incentive enough for me to stay clear of it. :D Great post man! I love the fact you touch issues that aren't being touched anywhere else online. :) That's Awesome, bud! !